Do you have a fear of speaking in front of groups? Presenting in front of an audience can seem like a terrifying experience. Some say it’s a fate worse than death. But FIU experts agree public speaking is a skill that every student and professional needs to master to succeed. The key is to increase your confidence through practice and preparation. With 47 years of experience in the realm of public speaking, the knowledge Kurland has acquired throughout his career has reinforced his passion. “I think I have a natural desire to be in front of people. I love it because I feel an inner charge, the adrenalin rush. Some people call it fear, but I love it. When you feel your heart pumping, it’s proof you’re alive. I love that rush. For me, it has been a very positive feeling,” he says. 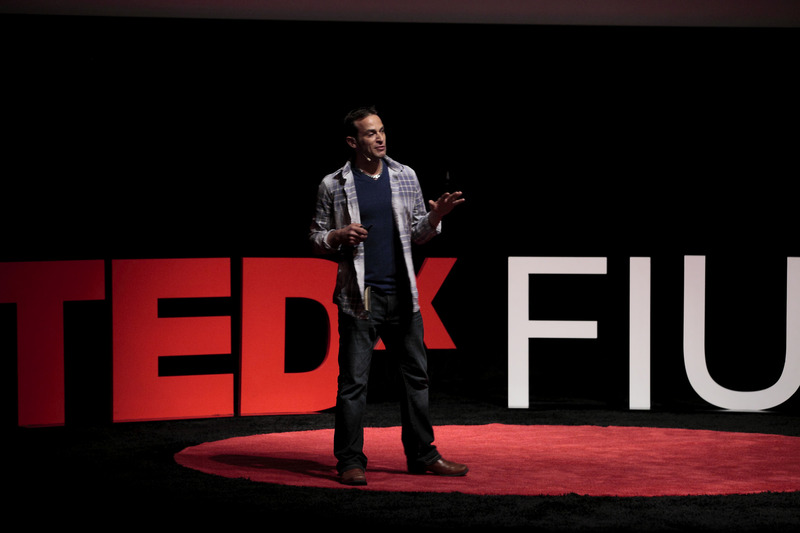 Global philanthropist Doug Jefferies delivers his TEDxFIU talk in 2014. Charlene Eberly, TEDxFIU speech coach and University Advancement editor, has more than 20 years of public speaking coaching experience. She was a trainer and executive coach for private, government and corporate clients, and the former director of FIU’s Communication Studio. 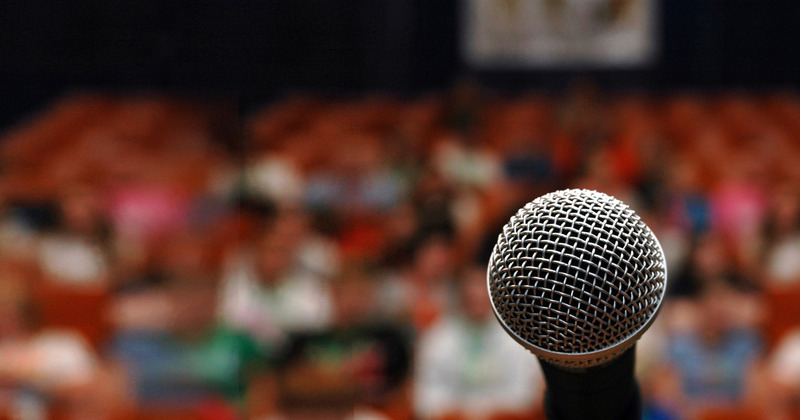 The first step toward becoming a better public speaker is preparation and organization. The more you practice, the easier it will become. “When I’m prepared, I’m confident. Preparation is definitely a big part of it,” Eberly says. Know the content of your speech by heart and become familiar and comfortable with your topic. Rehearsing in front of a mirror might make you feel more comfortable, but Kurland recommends live rehearsals. A lot of time is spent on the information in the presentation and very little time practicing the delivery. Reciting in front of someone who can provide you with feedback is one of the best methods. Whether you’re speaking to a group of grade school students, or professionals in the work environment, it is important to remember who your audience is. The more you understand about your audience, the better you can prepare for your speech. This can allow you to build common ground between you and them. Building a connection between yourself and the audience can minimize your anxiety. “You forget to worry about how you are doing and that makes you feel better,” Eberly says. “Tell them a story and share something that will interest, inform and inspire them. Leave them interested, not bored or worn out from listening,” she adds. During a presentation, be mindful that you are to be the center of attention. Your goal is to catch your audience’s attention and keep them focused on you rather than visual aids. “PowerPoint, Prezi and other visual aids are meant to add elements to your presentation, not be the presentation. You are the focus, so limit your slides and go to a black slide in between visuals to bring the focus back to you,” Eberly says. Anxiety is a factor that seems inevitable. Kurland and Eberly suggest turning anxiety into positive energy. Kurland insists positivity is key: “What I try to communicate to my students is that they should learn to embrace it and channel it into positive energy.” Kurland prefers to begin his talks with a joke or riddle to break the ice and start off with a positive response. The trick is to use your anxiety as fuel, rather than allowing it to paralyze you. “Once you’ve successfully done it and gotten to the other side of the speech or presentation and you realize you’ve survived it, it helps make it easier the next time. Relax and do your best,” Eberly says. I agree with Professor Kurland that public speaking instruction is very important for today’s college students. Billionaire Warren Buffett has some advice for college students: master the art of public speaking. Buffett once told a class of business students that he would pay anyone in the room $100,000 for 10 percent of their future earnings. If they were good communicators, he would raise his bid by 50 percent because public speaking would make his ‘investment’ more valuable.” Students who successfully complete a public speaking course significantly raise their value in America’s very competitive work environment. A national survey by Conference Board found that only 25% of today’s college graduates enter the world of work with well-developed speaking skills.